Afterglow is a five-piece set from Marseille featuring Reno Ferre on lead guitar, Karim Abdelali on drums, Francois Festy on keyboards and vocals, Claude Figge on congas and Freud Chaudeaux on lead vocals (Chaudeaux sings in English and sounds a bit like Steve Hoggarth). Deftly avoiding overly simplistic formulas, their style is a savvy combination of hard material from the old guard (Saga, Rush) and more modern neo-progsters (Pendragon, IQ). 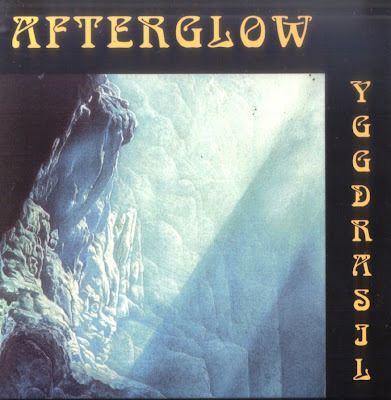 Achieving a good balance between vocal and instrumental pieces, their album "Yggdrasil" features some clever compositions and contrasting moods with rather dark overtones. Chaudeau's accented vocals may be a little distracting at times but the excellent songwriting and instrumental performance are what really stands out, far outweighing such minor flaw. The album centers around two epic-length tracks containing a variety of themes and textures; they also don some neat guitar work and lovely keyboard playing. Recommended for neo-prog buffs who want to add a little depth to their collection.